This is a handy feature which allows you to manually switch between open and close modes. This feature is useful if your business does not have fixed opening hours and you want to manually activate these modes. Please note that you activate the close mode, the system will override the current Opening Hours settings, which you can manage on our website. 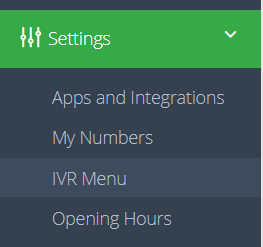 Each IVR (Call Flow) has its own set of opening hours which can be customized individually. Flick the button left or right for Opening Hours Override to change between modes. When the button is set to closed, the system will perform the out of hours action until you switch it back on.